Like a person who has filled their Boca Raton timeshare with As Seen on TV knives and garage-sale furniture, we simply cannot pass up a good deal. It's just not in our genes. Hence, we've compiled this definitive guide to the best happy hour option across 25 Chicago neighborhoods, allowing readers to drink and eat like they're twice as rich (or half as poor). Offering something different on each day, Pork Shoppe keeps thrifty patrons happy with $3 drafts on Tuesdays, $5 ginger beer cocktails on Wednesdays, $6 glasses of wine on Thursdays, and $5 summer cocktails on Fridays. Ready to get the night rolling, but need to get off the couch before The Shawshank Redemption pops on? Head to Late Bar and throw back $1 PBRs at this anything-goes dance spot. Stop in at this beloved neighborhood haunt for $5 draft cocktails, including a Rosemary Fizz (gin, rosemary, lemon), Tequila Sunset (tequila, Aperol, lime, agave), and a Palmers Pint (ginger-peach vodka, black tea). This industry favorite offers its happy hour all week. Stop in for half-off all wines by the glass and by the bottle, half-off draft beer, and half-off small plates. Malort: Sin Against God OR Actually, Kinda Good? Oysters and beer on the cheap? No, you haven't died and gone to Belgium. Cold Storage offers $1 oysters and $3 drafts on weekdays. Walk right past the Ferrari parked outside and grab a seat like you manage hedge funds in your sleep, because Hugo's Frog Bar offers $1 oysters, half-price white wine glasses, and half-price Vesper martinis (Plymouth gin, Absolut Elyx vodka) every day at the bar. After trying to spot some Monk Parakeets in Washington Park, head on over to Yusho for $3 Kirin lagers, $4 ice cream, $5 steamed buns with fries, and $6 draft cocktails. Visitors will have to grab a seat at the bar and order a food item first, but after that they'll enjoy half-price drafts and cocktails (usually $6), including classics such as Negronis, and specialties such as the Lowcountry limeade (Fords gin, lime, brown sugar, basil). Available in the main dining room and on the rooftop patio, this happy hour includes $1 oysters, as well as half-price drafts and tapped cocktails. 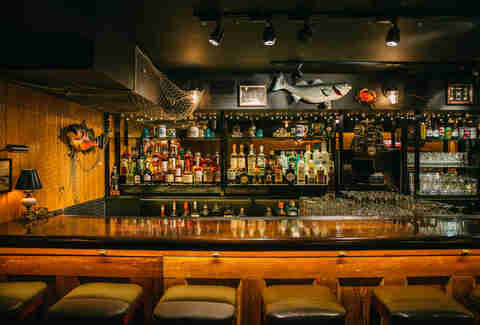 We recommend checking out the gorgeous basement bar (aka the Low Tide Lounge) for this happy hour, which includes half-priced oysters ($18 for dozen), $5 Cape cocktails, and $4 Anchor Steam pints. 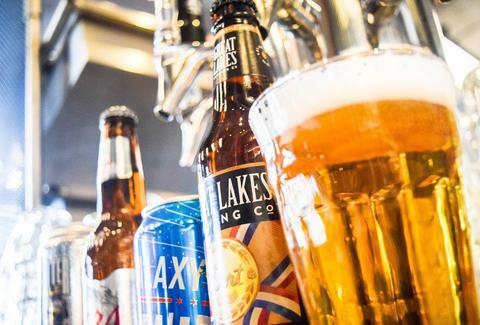 Running a bit later in the night, the happy hour at Roots Handmade Pizza (also available at the West Town location) offers $3 16oz Midwestern craft drafts, and $5 appetizers such as fried ravioli, loaded hummus, and artichoke dip. One of our favorite new restaurants, this casual eatery offers a plate of salumi and cheese with a glass of wine for $10. Go. Now. 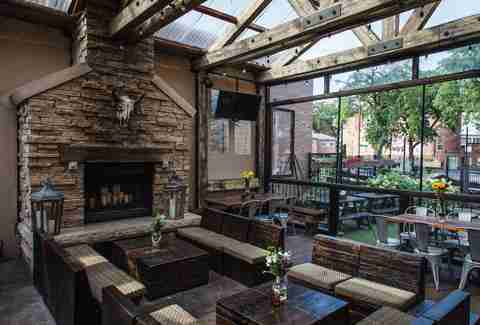 There are several Rosebud locations, but this one boasts a breezy, European-style patio in the middle of the Loop. During happy hour, enjoy $5 house martinis, $5 house wines, $3 domestic beers, and $3 bar bites such as sticky ribs, popcorn shrimp, spicy calamari, and tater tots. The first bar to offer (re-legalized) happy hour deals in Chicago, The Ogden is basically asking patrons to call off work for the second half of the day. Stop in to score half-off drinks, and enjoy craft beers as low as $3, specialty cocktails for $5.50, wine bottles for $14, and cheap beer for $2. Who doesn't like $1 oysters? No one, and Frontier has them, along with $2 Miller High Life, $5 Glass of Rosé, and $8 Frosé (Frozen Rosé; available on Friday only). Located inside the historic Dearborn Station, this is hands-down the coolest Bar Louie you'll ever visit. Do so after 10pm and get $3 martini shooters and half-off apps, alongside daily specials such as $1 burgers on Tuesdays and $1.25 domestic bottles on Wednesdays. You'll probably have to call out of work/school/military service for this one, but if you do, $3 Deschutes Brewing beers await. River North is actually packed with great happy hours (from Tortoise Supper Club's $1 seafood to Ocean Cut's Shark Bar flights) but this is the Big Kahuna of happy hours. Wednesday through Friday, Fremont offers Moscow Mules and Japanese fried chicken for $5 each. 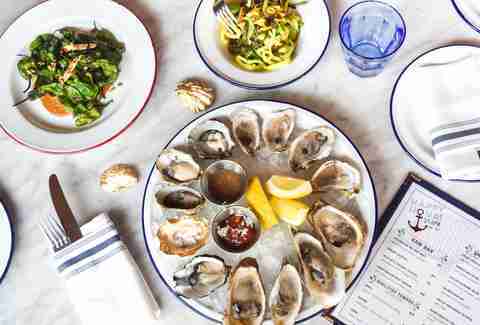 However, don't hesitate to bring a date on Thursdays, when two hours of bottomless oysters and rosé costs a mere $20 per person. Don't forget to casually mention that you definitely own a chopper. Rogers Park Social is as good a spot as any to bring your Tinder Tuesday date, and as a bonus, you can order a build-your-own mule for $5 (vodka, gin, rum, bourbon, or tequila). Also: $5 off a bucket of beers. 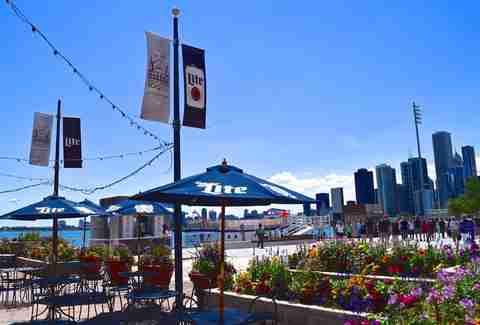 In the unfortunate event you must resort to drinking in the vicinity of the wallet-gouging Navy Pier, the Miller Lite Beer Garden actually offers some pretty decent happy hour deals. Mainly: $3 Miller Lite and Coors Light drafts, $5 Henry’s Hard Ginger Ale, and $6 nachos. This deal will get the party started like the ghost of Elvis appearing at the Las Vegas Elvis Festival. Pop in for two shots of Malort and a 32oz mini pitcher of Old Style for $10. Offered every day of the week, the happy hour specials at Ph.D Pub are exactly what the doctor told you to cut back on. Oh well. Monday through Saturday, enjoy half-off well drinks and $6 boilermakers (PBR, Rolling Rock, Tullamore DEW, Fireball), as well as $5 vodka lemonades and screwdrivers on Sundays. Four days a week, this happy hour offers $5 highballs, $6 wine glasses, $5 drafts. 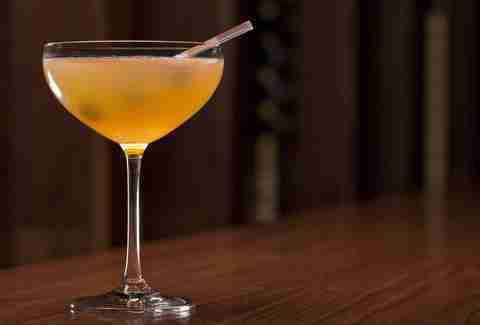 Select cocktails, such as the Manhattan or gin and ginger, are a wallet-friendly $6. Sepia is one of the finest restaurants in Chicago, and that sometimes overshadows the fact that its bar staff is also exemplary. Offering a Greatest Hits menu that showcases items from the past eight years, Sepia's happy hour invites patrons to enjoy $7 cocktails, wines, and beer. Bites such as pork rillettes and shishito peppers are also available for $7. Pound for pound, Easy Bar has one of the best drinking happy hours in Chicago. On Mondays, score a domestic bottle and shot of Powers whiskey for $4. Wednesdays offer $4 Old Fashioned cocktails. Thursdays have $4 Old Grand-Dad whiskey cocktails. $5 Last Word cocktails are the name of the game on Fridays, and weekends offer $5 Absolut Bloody Marys and Ferris Muellers. Raf Miastkowski is the content director at Olio City and hasn't paid full price for a drink since 2009. Send him hot tips on specials @RafFoSho.